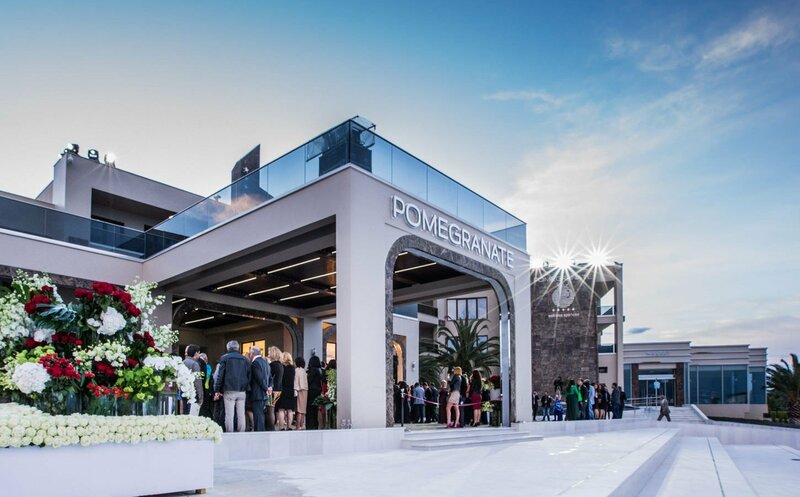 Considered as one of the top Halkidiki business meeting venues, the Pomegranate ensures that every business guest, as well as their accompanying partners will enjoy a memorable experience. There is nothing like a spectacular location to impress, inspire and vividly remain in the memory of your guests. The Pomegranate Wellness Spa hotel offers event facilities every bit as inspirational as its surrounding environment. The hotel’s ideal location and setting can turn a special event into something truly memorable, while the serenity of its surroundings makes it an ideal place for executive meetings, retreats, incentives and exclusive events in Halkidiki. Just a 30-minute drive from Thessaloniki’s International airport, this beach-front resort is considered the top Halkidiki conference hotel for business meetings and events that are bound to be a success due to the exceptional combination of luxury accommodations, upscale services, state of the art technology, high end business facilities and the unique natural environment that it provides. Its close proximity and strategic location, makes it an alternative venue for organizing and planning a conference in Thessaloniki. Versatile and technologically innovative, the new Congress & Conference facilities at the Pomegranate Wellness Spa Hotel offer premier Halkidiki conference facilities and meeting venues for both large or private business gatherings. With over 1,500 sq. m. of meeting room space – featuring a high-tech main auditorium, with AV installations never before featured in any hotel conference center, ideal even for music concerts or corporate presentations, we guarantee that your event will be a unique business experience for you as well as your guests. Designed to cater to the business needs of the most demanding clientele, the conference facilities at the Pomegranate can accommodate a total of up to 650 delegates, in its state-of-the-art halls. The main auditorium hall, with a capacity of 500 attendants in theater style, is perfect for international congresses, corporate events or concerts, featuring the latest in audio-visual equipment, translation booths, high speed Internet and excellent technical support. Four (4) additional break-out halls with smaller capacities can equally cover the needs of smaller professional meetings or events. From the very first consultation with our Event team, you will be put at ease by our range of professional experts, our audio consulting and production specialists as well as our technological and general business staff. Our expert team lends its event-planning expertise to any business event while also providing our executive guests with complete decoration proposals, customized conference resort amenities and full office support. At this unique Halkidiki conference hotel we will sure surpass your meeting expectations!